Philip Morris Napier – ex-convict, Windham recluse and civil rights advocate – may seem an unlikely candidate for Governor. He’s not bankrolled by any party. No glitzy galas or press conferences announced his decision to run. By looks alone, he is not your typical suit-and-tie politician. But there he is, day after day, with his long ponytail and wild wiry beard of red and gray trickling down to his overalls and flannel shirt. Seated behind a table splayed with blue petition forms, he’s all smiles and full of “howdys” as he greets visitors to the Windham Town Offices. 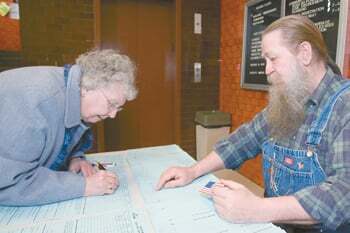 He entreats each person to sign, not as an endorsement, but to get him on the ballot in 2006. Napier has yet to get on the horn like he did the last time he ran for governor. In 2002, he cruised from Kittery to Fort Kent in a yellow Volkswagen van while shouting over the loud-speaker his campaign platform: no state income tax, lower the voting age to get the youth involved in politics earlier, kick lawyers out of the judges seats and overhaul of the prison system to make it self-supporting. He’s considers himself an advocate for felon rights and created the organization “Felons United” to fight against the stigma of being an ex-convict, a stigma that he says keeps ex-cons from getting equal housing and jobs. The whole impetus for his ongoing run for governor stems back to a 1995 shootout with the Windham police in which he’s thoroughly convinced the cops were out to kill him. April 19, 1995. A day that will go down in infamy and sorrow, the day the Oklahoma City bombing rattled the nation. He had just finished a meeting with the Internal Revenue Service, which were his former employers before he turned to private tax consulting, and stopped into J’s Oyster Bar in Portland for lunch. He was shocked to see the news on the television there: the rubble and smoke of the government building and reports of the killed and injured. Napier returned home to his hunting cabin on Highland Lake. After a short nap, he awoke still frustrated by the news and angry with his ex-wife whom he’d recently divorced. And so, he decided to let off some steam by firing more than 30 rounds into a woodpile outside his house. A good way to “get rid of old ammunition,” he says. He’d unloaded several rounds from several guns – a .44 magnum, an M1 carbine, a 12-guage shotgun – before the cops arrived. Napier had gone inside to load a .22 caliber pistol he planned to fire next when he turned and saw Officer Richard Ramsdell in the doorway with his gun pointed at him. “He had his gun on me and I had my gun down, not pointed at anyone,” Napier says. Napier claims he stumbled forward after tripping on the leg of his couch. The officer then ran and hid behind the woodpile, firing and missing Napier. The officer’s brother, Sgt. Ronald Ramsdell standing nearby then opened fire hitting both of Napier’s legs. All the while, Napier claims he never heard the police identify themselves. He says he jumped behind his bed and pleaded for the police not to shoot him again. He then fell unconscious. When he came to, they had him handcuffed. It’s difficult for Napier to walk now; a brace holds his paralyzed foot and his left leg with a crater wound from the shooting. He recounts the story with a calm, cool look in his soft, blue eyes. But Officer Rick Ramsdell testified in police records that there was a different look in his eyes that fateful day, a “devilish” and “vacant look” that stared right through him. And the police reports tell a story contrary to Napier’s. According to the report, Officer Rick Ramsdell arrived at the scene after getting a call from dispatch that someone was firing across Highland Lake. The dispatch warned that the suspect may be “mentally disturbed.” He waited for his brother, Sgt. Ron Ramsdell, to arrive as back up and then approached the residence. Ramsdell had met Napier prior to this when he served him with protection from abuse papers, filed by his ex-wife Melinda on behalf of his son. After patrolling the premises, Ramsdell spotted Napier in the house and approached the open door. “Windham Police, Phil are you in there?” he is reported saying. He then saw Napier and what appeared to be a rifle on the table. Napier turned toward the door, a pistol at his side. “Police. Drop the gun or I’ll shoot,” Ramsdell reportedly said. Allegedly, Napier then raised the gun with that “vacant stare” in his eyes. Afraid for his life, Ramsdell jumped behind the woodpile and fired off a retreating shot. Meanwhile, Sgt. Ron Ramsdell, believing his brother was in danger, opened fire and hit Napier in both legs. A jury would later convict Napier of criminal threatening against Officer Ramsdell, but dropped the charge of criminal threatening against his brother, Sgt. Ramsdell. Napier was served with three years in jail with all but 15 months suspended. Windham police would later settle a civil suit brought by Napier claiming excessive use of force for which the department settled out of court for an undisclosed sum. While awaiting trial, Napier began his first run at governor collecting signatures. After being convicted, he smuggled his petition forms into the old Thompson jail and had the inmates sign. The guards eventually took the petitions away, but that didn’t stop Napier. The inmates came to know him as “The Governor,” he said, as he continued his campaign behind bars. Napier hopes to gather signatures from inmates again this time around. However, Commissioner of Department of Corrections Mark Magnusson has refused to allow him to visit the prisons or circulate his petitions among the inmates citing that it is against their policy. The Maine Civil Liberties Union is looking into the case to see if his rights are being infringed upon. “It’s an infraction of my rights as a candidate, and it’s an infraction of the rights of those who are locked up,” Napier says. For now, he continues diligently to gather signatures from residents at Windham Town Offices, with his loyal lady, Belle, at his side. He asks them to sign and sometimes he talks about the issues. Some gab and gripe about how there needs to be a real change in the state’s capital. Others are a little wary of this bearded man soliciting their signature as they go about their business at the town offices. Police Chief Rick Lewsen defends his officers’ actions and certainly hasn’t forgotten Napier. “I respect his right to run, but I won’t sign his petition or vote for him,” Lewsen said. As for Napier, he is devoted to his cause of felons rights, fair courts, and a campaign based on his interpretation of the Maine constitution. He will continue to greet visitors with his drawl “howdy” at the Windham Town Offices until he collects the 6,000 signatures needed to get him on the ballot. Philip Napier, who is trying to raise 6,000 signatures for his gubernatorial candidacy, sits in the lobby of Windham Town Hall as a resident signs her name.